Okra, minced into approximately 5 mm pieces. Can be eaten with bonito, tororo, or squid and sauce. 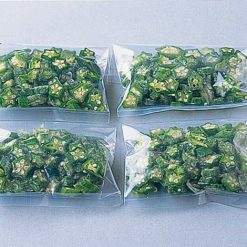 This okra has been minced into approximately 5 mm pieces and is ready for immediate use once defrosted. The okra used was 6 to 8 cm in size before mincing. 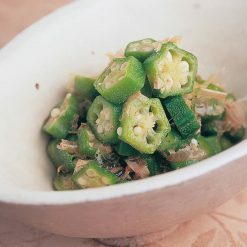 Our minced okra can be eaten with sauce and bonito, tororo (grated yam), or squid. Minced okra can be a great way to get kids used to its unusual texture and flavor until they’re ready to try whole slices of okra in curries or other dishes. Okra’s unique texture also makes it great for adding to salad or using as a garnish for variety. Okra contains vitamin C, folate, potassium and magnesium. Sugarlady’s produce is harvested in season and then frozen immediately in order to ensure the highest possible nutritional value and best flavor, and because our produce is blanched before freezing, it remains vibrant and undamaged when frozen for long periods. Transfer the minced okra (still frozen) to a small bowl and microwave without covering the bowl. In a 500W microwave, heat one bag for 1 minute 20 seconds, two bags for 2 minutes 10 seconds, and three bags for 3 minutes 40 seconds. In a 600W microwave, heat one bag for 1 minute, two bags for 1 minute 50 seconds, and three bags for 3 minutes. More or less cooking time may be required depending on the model of microwave. Okra and bowl may be very hot after microwaving, so please use caution to avoid burns. This product contains okra (China) . Origin of ingredients: okra (China). Prepared and packaged in China.